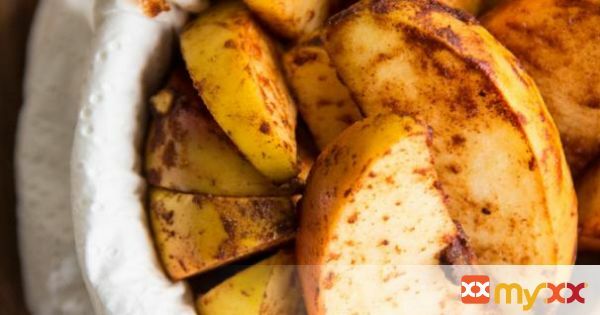 Baked Cinnamon Apple Wedges - 4 ingredients, 2 mins prep and 10 mins in the oven. Simple & delicious. 2. Cut the apple into about 10-12 wedges and mix it with the rest of the ingredients. 3. Place the apple wedges in a small baking dish or on a baking tray – aim for a single layer. 4. Bake in the oven for 10 minutes. The apples should be golden brown and cooked all the way through.